Ryu Spaeth is moving over from The Week. 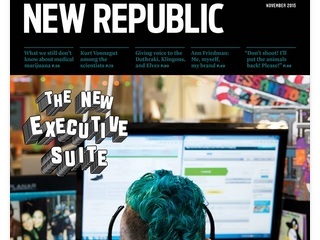 TheWeek.com deputy editor Ryu Spaeth (pictured) will soon be serving in that same capacity for New Republic’s website. And when his service begins later this month, he will be reporting to a three-year vet at the magazine, Ryan Kearney, who has been promoted to executive editor, digital. I am writing with some very exciting news. First off, I am happy to name Ryan Kearney as an Executive Editor for digital. In his new role, Ryan will be taking on more responsibility for strategizing and managing our efforts on digital platforms, including the web and social. Ryan has been with the New Republic for three years, first joining in October 2012 as a Story Editor. Last September, he was named Executive Web Editor, a (slightly clunky) title that reflected his increased responsibilities of running our website and shaping digital presentation. In this new position, reporting into me, Ryan will continue to be an important mentor for our staff and a senior leader for our D.C. office, while he takes an expanded role in managing our growing team, plotting overall editorial strategy, and overseeing the creation of our great journalism. We also have a great new addition to the New Republic: On October 26, Ryu Spaeth will be joining as a Deputy Editor in which he will oversee the day-to-day operations of our web site. Ryu joins us from TheWeek.com, where as a Deputy Editor he overhauled their site, expanded coverage, and grew their audience. He previously has worked at Time and HarperCollins Publishers. Ryu was born in Hong Kong and raised in Manila and New Delhi before moving to Massachusetts to attend Williams College. Ryu will work out of our New York office and report into Ryan. Please join me in congratulating Ryan on this very well-deserved promotion and welcoming Ryu! Spaeth will soon have some other new colleagues. The magazine is currently hiring a national news editor, a senior editor and a staff writer.